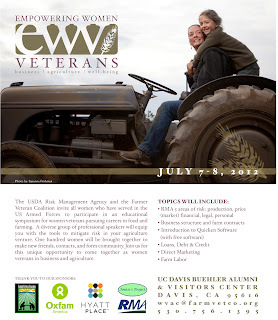 Davis, CA April 2012—With the help of the USDA Risk Management Agency and Annie’s Project,the Farmer Veteran Coalition (FVC) is excited to host the “Empowering Women Veterans: Business, Agriculture & Well-Being” conference in Davis, Ca on July 7-8, 2012. This conference will be the first of its kind, aiming to bring women veterans together in an environment specifically designed to address their unique experiences and needs in agriculture. Upon re-entry into the civilian population, veterans face increasingly high unemployment rates. The number of homeless female veterans more than doubled from 2006 to 2010. At this conference, women leaders in business and agriculture will speak to female veteran participants about the challenges faced by women, the tools to mitigate risk in their agricultural ventures, and available programs to help women farmers succeed. Educational topics will include the RMA five areas of risk(production, price (market), financial, legal, and personal); business structure and farm contracts; an introduction to Quicken Software (with free software); loans, debt & credit; direct marketing; and farm labor. Interested parties may contact: wvac@farmvetco.org or call FVC at (530) 756-1395. The Farmer Veteran Coalition seeks to mobilize our food and farming community to create healthy and viable futures for veterans on America’s farms.